If you would like to experience a fast disappearing way of life, then this is the place to stay. The traditional village of Kritou Tera, tucked away from the usual tourist trail, yet with easy access to both mountains and beaches, can provide an insight into traditional Cypriot culture. The property is located on the edge of this compact village close to the Akamas National Park, with delightful views over sea and mountains. Situated at 500 metres above sea level, the climate is perfect in the hot summer months. The Cyprus Environment Centre is housed in the old village school indicating the value of this location for anyone interested in the natural environment and the habitat of the flora and fauna. Many organised walking and bird watching holidays are based in the Akamas, with it's variety of coastal paths or high level walks, all with spectacular views. Excellent base for mountain biking in Akamas or the Troodos Mountains. The recently refurbished Droushia Heights Hotel in the neighbouring village, provides an amazing infinity pool which is open to the public all day, if guests purchase drinks, snacks or meals there. So, the Jacaranda is a perfect location for either an energetic or restful break. My husband and I and our family lived and worked for many years in Cyprus, so we know the island very well. We eventually decided to buy a small holiday property and realised it would have to be in the Akamas area, as it's the most beautiful and unspoilt part of the island. We purchased the house in 2002 and used it extensively as a bolt-hole for weekends, as well as for longer holidays. Although we are now retired and living in France, we regularly revisit Cyprus as we have friends in the village and miss the friendliness of the local people. Having discovered this part of the island many years earlier, we returned two or three times a year from our home near Larnaca, in order to camp by the beach in Polis Chrysochou. There was no contest about location once we had decided to buy a property of our own. We love the simple lifestyle and quiet location well away from the tourist areas and concrete jungle that is now Pahos; not to mention some wonderful restaurants in the area. A traditional village house with it's quirky features was more attractive to us than a modern villa with a pool. The beaches are near at hand! It provided sheer escapism from our busy lifestyle! Our village of Kritou Tera is located in a stunning position overlooking Polis, with easy access to Polis, Latchi and Paphos, as well as the beaches and mountains. We love visiting the beaches but didn't want to live near them and their inherent bustle, potential development and traffic. Kritou Tera is a perfect location in which to enjoy the peace and quiet of the countryside, observe (and even get involved in) the local way of life and be surrounded by wonderful walking and cycling country with fabulous views. The panoramic views from our terrace, veranda and balcony are simply outstanding, as you will gather when reading our reviews. Living room comprises a dining area and lounge. Dining table and chairs with separate desk. Newly installed wood burning stove in lounge. The settee converts simply into comfortable double bed. Satellite TV(12UK channels) WiFi, DVD player & music system. The jewel in the crown! Fabulous views of both mountains and coastline. Relaxed seating and sun umbrella provided, while you admire the scenery. Very spacious terrace, overlooking garden, equipped with large sun umbrella, dining table and chairs. Plenty of room for the sunbeds and hammock as well! 3 golf courses within easy reach Nearest golf course, Tsada (Minthis Hills), is 30 minutes drive away. The new Elea course, designed by Nick Faldo, has recently opened near Paphos. 35 kms Secret Valley and the luxurious Aphrodite Hills Golf courses approximately 45 minutes drive away. Notes on accommodation: No smoking please. Some firewood is provided for the wood burning stove and extra electric heaters are available if required. Outside: The outside area is on two levels. Firstly, from the double entrance gates is a spacious area for parking. To the left is the garden area with raised flower beds containing typical Mediterranean trees, shrubs and flowering plants, such as bougainvillea, lemon and a beautiful Jacaranda, from where the property gets it's name. In one corner of the garden, framed by bougainvillea is a coffee table and chairs. It is carefully positioned to make the most of the winter sunshine. Wide shallow steps provide easy access to the large patio area which extends out from both the kitchen and lounge doors. The patio has wonderful views across the valley towards the Troodos mountains and along the North coast of the island. Your ideal spot for that BBQ and al fresco dining. Utility Room: The washing machine is fitted into an outside storage area accessed from the patio. Cleaning / Towels / Linen / Maid service: Linen & towels provided, including separate beach towels and tea towels. All linen changed weekly. Cleaning weekly. Other: Upstairs terrace - the jewel in the crown! Accessed from upstairs balcony or bedroom, this area is perfect for sunbathing or relaxing whist admiring stunning panoramic views over mountains and coast. The perfect location for those pre- dinner drinks. There are many excellent beaches around Polis and Latchi within 15-20 minutes drive. Our favourite is the Polis Campsite Beach and the Anassa Beach to the west of Latchi. Famous Coral Bay, on the west coast is about 30 mins drive. Then there is Lara...imagine a long sandy beach shore with nothing populating it but turtle eggs and a handful of people ... with inviting clear blue waters. No sun beds, no umbrellas, no beach games! This is the Cyprus Turtle Sanctuary - well worth a visit. Paphos airport:40 minutes drive. Larnaca airport: 1 1/2 hours. Detailed directions from the airports to the house are provided to all our guests. A car is essential for this property. This area of western Cyprus regularly enjoys an amazing 340 days of sunshine a year. With daytime winter temperatures rarely dipping below 18C, it is regarded as an all season, sunshine location. In the summer months, the cooling sea breezes and 500m elevation keep the heat and humidity to a pleasant level, unlike some other areas of the island. 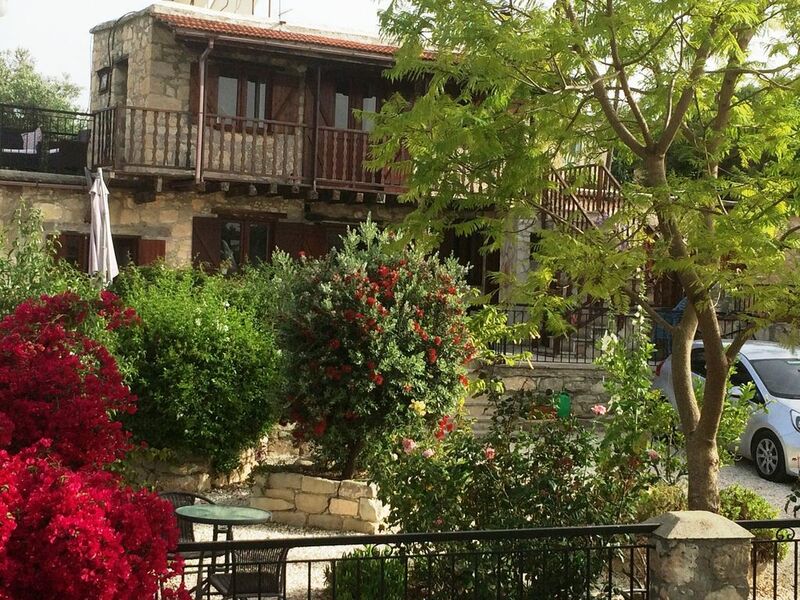 Kritou Tera is surrounded by countryside ideal for walking, cycling, bird watching & horse riding. A wine trail can be found in the neighbouring village of Kathikas and an excellent wine (both red and white) can be bought direct from the winery there. Latchi is the watersports centre of this area with kite surfing, snorkelling and Padi Diving courses. Boat trips along the coast to small bays inaccessible by car are available from Latchi. These usually include a meal and opportunities to swim and snorkel. The baths of Aphrodite, where she is reputed to have met her lover Adonis, are a few miles west of Latchi. This is also the gateway to the Akamas National Park. Marked walking or mountain biking trails, can be followed from here with suitable shady picnic sites en route to viewpoints overlooking the whole of the Akamas Peninsula. The forest to the east of Polis also has nature trails, as well as a Mouflon enclosure where these shy, native creatures can be seen in their natural environment. (1 hour). Paphos Town, about 45 minutes drive is well worth a visit. The old town and market provide a fascinating variety of quaint streets and little shops. The newer resort area on the coast overlooks the famous harbour with Paphos fort. Paphos boasts many archaeological sites, notably the world famous mosaics and the Tombs of the Kings. There are many excellent local restaurants in the neighbouring village of Kathikas and in Polis and Latchi (fish is the local speciality in those around Latchi Harbour.) Between Latchi and Polis is a Chinese restaurant, which also provides takeaways with other takeaway possibilities in Polis.